Austin gets a lot of press as a “cool place to live.” It is a growing city full of technology jobs, expensive coffee shops, and the other supposed signifiers of a “hip city.” Something that nobody mentions when listing Austin’s draws: it’s the only city in Texas where you can vandalize original portraits of the state’s governors. 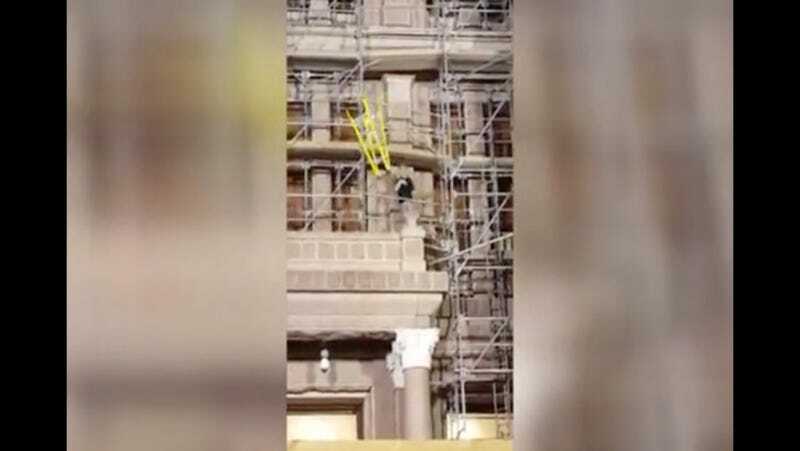 This brings us to the case of Tanner Graeber, a 22-year-old Fort Worth resident who got arrested early Sunday morning and is facing charges of burglary and criminal mischief after he broke into the state capitol in Austin and threw a portrait three floors down to the rotunda floor. A Department of Public Safety trooper spotted Graeber climbing on scaffolding outside the building. He then broke a window on the second floor and climbed in. An apparent passerby got video of Graeber climbing around and throwing a ladder. He’s a ginger so, per the viedographer, that explains why he’d climb around and get rowdy. Once he made his way inside, Graeber threw a fire extinguisher and a portrait three floors to the rotunda floor below. The painting was of former Texas governor Fletcher Stockdale, who served in 1865 for all of three months after his predecessor Pendleton Murrah, a Confederate sympathizer, fled to Mexico after the Civil war ended. Graeber allegedly caused $10,000 of damage to the frame and painting. Graeber was taken to Travis County jail and released last night on a personal recognizance bond. If Graeber chose to damage that particular painting, that makes him the first person this century to hold an opinion on Fletcher Stockdale.